Ah, the Marlborough Sounds. In many ways, it’s like visiting the land that time forgot. Its rugged islands and miles of native bush stretching down to the sea look like something out of Jurassic Park. This is a place where you can truly unplug from the stresses of modern life and get into nature! Best of all, the Sounds have a plethora of fantastic hiking options. 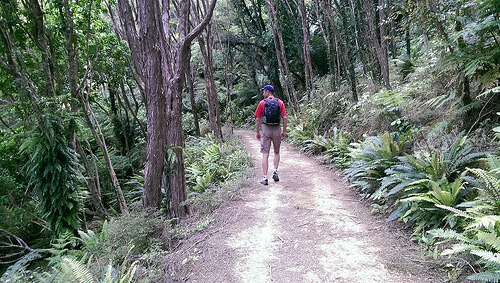 Queen Charlotte Sound’s day walk has some great short hikes within it, which is good news for time-short travellers! 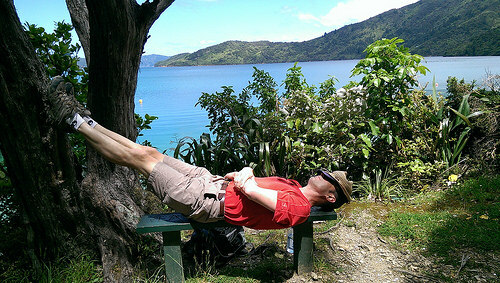 We recently did the 2-hour Queen Charlotte Sound day walk Marlborough from Ships Cove to Resolution Bay. We thoroughly recommend it! The Marlborough Sounds are made up of a network of sunken sea valleys, resulting in the spectacular coastline of inlets, bays and islands. This network stretches over 4000 square km, with many areas completely untouched by any human settlement. It’s this very area that the Interislander ferries pass through on their 3-hour journey between the North and South Islands. Queen Charlotte Sound is the eastern-most of the sounds, with the port town of Picton sitting at the head of the inlet. Picton is where the Interislander ferries leave from en-route to Wellington as well as numerous other cruises, so it’s a great location to focus on during your time here. It’s home to the magnificent Queen Charlotte Track, which stretches for 70km up to the village of Anakiwa. The route from Ships Cove to Resolution Bay is one section of this track, and is home to stunning coastal views! 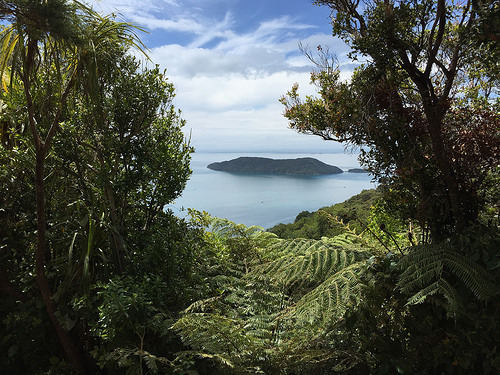 The downside of the Marlborough Sounds is that it isn’t always the easiest area to explore. Many areas are accessible only by boat, as some are protected by the Department of Conservation and the terrain is very difficult to build roads through. Residents who live year-round in this area actually have to get their mail delivered by boat! 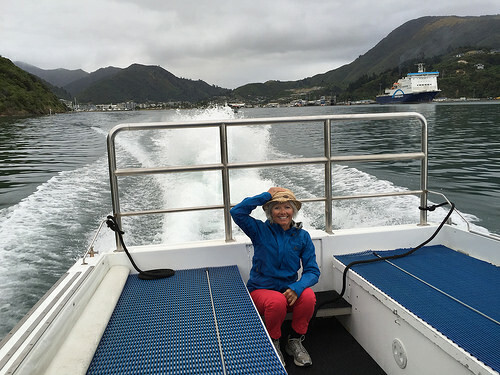 To reach Queen Charlotte Sound, you will need to catch the water taxi from Picton to Ship’s Cove. It’s important that you factor this journey time into your trip planning, since there are only so many hours in one day. It’s only a 25 minute from Blenheim to Picton, and 45 minutes from the town of Havelock near Pelorus Sound. 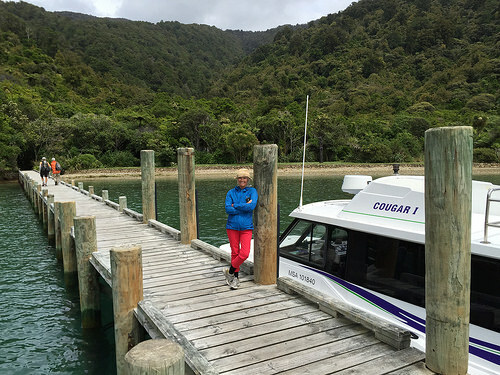 We used the Cougar Line taxi company, who specialise in transfers to the Queen Charlotte Track. The water taxi usually leaves at 8am and 10am. If you’re based in an apartment nearby, it’s only a short walk to the Picton Wharf. We were pretty keen and were up early at 6.00am. Planning and strategy is everything, so hold on to your hats folks! The friendly skipper, a local, happily pointed out penguins, dolphins and fur seals. We were so lucky to see all three! 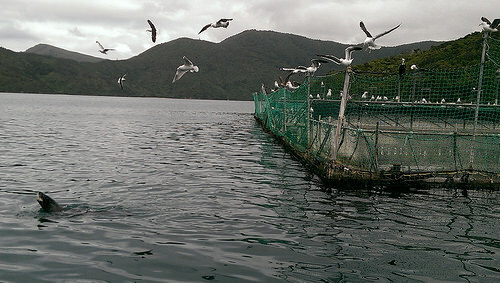 The first stop was at the Salmon Farm, which this area is very well-known for. It’s necessary to have plenty of netting around to prevent greedy seals eating the profits! 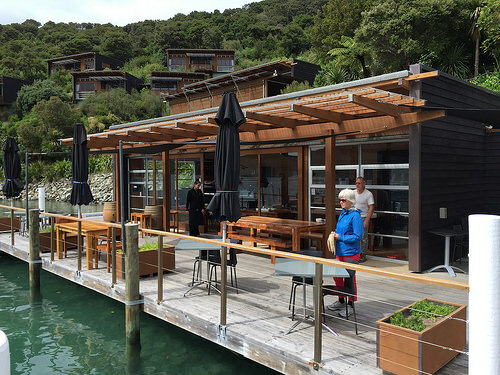 Next, we were off to the Bay of Many Coves Resort in Queen Charlotte Sound. There are many beautiful resorts through the Sounds which offer a more luxury experience of the area. This one is nestled in an especially tranquil piece of paradise! The Chalets are stylish and constructed of natural materials. There are three different restaurants at this resort, one of which caters for day visitors. We spent an hour meeting the staff before re-boarding a larger water taxi from the Cougar Line. This part of the trip was a great scenic ride. A half hour later, we disembarked at Ships Cove in Queen Charlotte Sound to begin our walk to Resolution Bay. Ships Cove gets its name from being the favourite anchorage spot of Captain James Cook during this exploration of New Zealand in the 1770s. It was also his place of departure back to Britain in 1777, making it a place of great historical significance. The cove is also stunningly beautiful, with lush forest and deep green waters. There’s a very interesting historical site at the beginning of this walk. 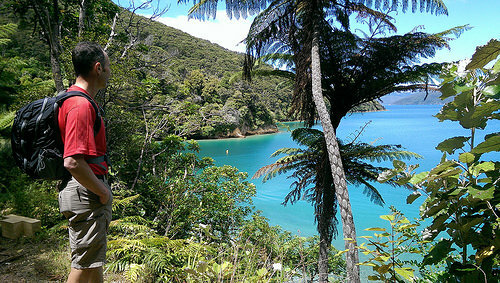 Ships Cove and the wider Queen Charlotte Sound also has much significance for the Maori people and is sacred to them. It was valued for its shelter and resources, and also marks one of the sustained areas of contact between Maori and the Europeans. Here, you’ll find a large display case with a written history of the area. 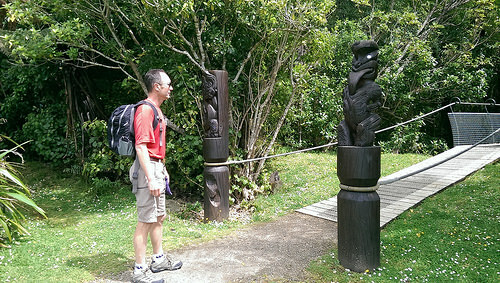 The Maori carving is a real treasure of intricate designs. Just a word of caution: you need to be reasonably fit for this walk. There is quite a bit of uphill walking, plus its also thirsty work. Always remember the essentials such as snacks, sunblock and of course, lots of water! Throughout New Zealand, you’ll often get the track to yourself. Today was no exception. It was incredibly peaceful, and such a privilege. Our early morning start was taking its toll on a certain someone and there was no better place to take a rest! 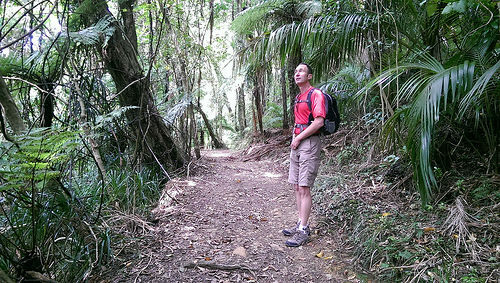 The forest throughout the Queen Charlotte Sound is alive with birdsong. The Tuis and Bellbirds are so melodious, and we love the special sound of the Kereru (Native Wood Pigeons) as they fly through the trees. Everything is thriving here! 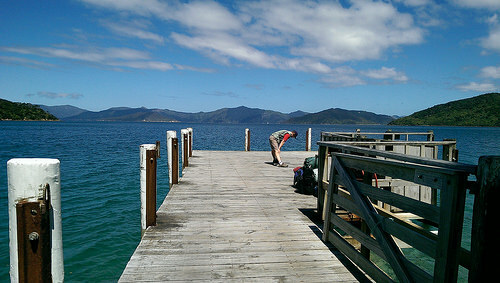 After we reached the wharf at Resolution Bay, there was only enough time to for a few stretches before being collected by our water taxi. For those who are a bit shorter on time or don’t want to do the full Queen Charlotte Track, the Ship Cove to Resolution Bay section gives a fantastic taste of what it offers. The boat was full of happy travellers, and it was a fun ride back to Picton! Sounds like you have a great memory to cherish from your Ship’s Cove to Picton bike ride Jan. Wish I’d seen those Orcas – how fabulous would that be! When you’re in a water taxi, you really feel like part of the community as they pick up and drop of people and parcels – sometimes is the only contact these lodge owners and their staff get for many days. Michael is having a 6.00am start tomorrow. I’ll be sleeping blissfully on this time!